It all started when I spotted a photo of a Grilled Caesar salad on Instagram from the Canola Eat Well team. I had heard of grilling romaine before but had never tried it. I love Caesar salad and I BBQ as often as I use the stove so it was high time I grilled some lettuce. 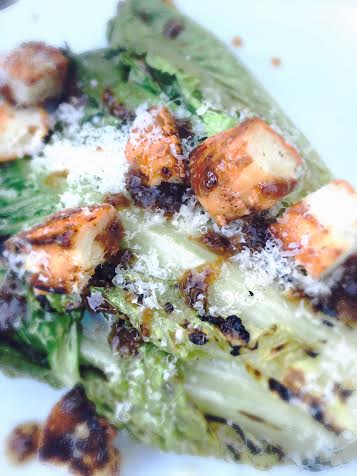 Grilling the romaine makes it very tender and gives the salad an amazing texture. The dressing is so fresh with the perfect hit of garlic and fantastic tanginess from the balsamic vinegar and grainy mustard. The buttery fruitiness of the reggiano is the perfect finish to compliment the dressing. The recipe looks long with a lot of ingredients but it is actually quick and easy once the mise en place is done. Arranging the ingredients takes more time then preparing the actual salad. You will find that after you make the salad once you will be able to get it together and plated within 15 minutes. A quick note: make extra croutons. They are so good you may find yourself and anyone else hanging around the kitchen snacking on them while dinner is getting prepped! For the croutons: Heat 2 tablespoons of canola oil in a pan over medium. Add the cubed bread sticks, tossing to coat. Cook until nice and toasty, 5 – 6 minutes. Add the garlic powder, a pinch of salt and pepper, 2 tablespoons of grated parmigiana reggiano and 1 teaspoon of lemon zest and the dried herbs, stirring well. Pour into a large bowl and let cool. For the dressing: In a small bowl combine the grated garlic, balsamic vinegar, grainy mustard, 2 tablespoons of grated reggiano, Worcestershire and 1 teaspoon of lemon zest. Whisk in 1/4 cup of canola oil. Set aside. Drizzle the romaine hearts and halved lemons with 2 tablespoons of canola oil. 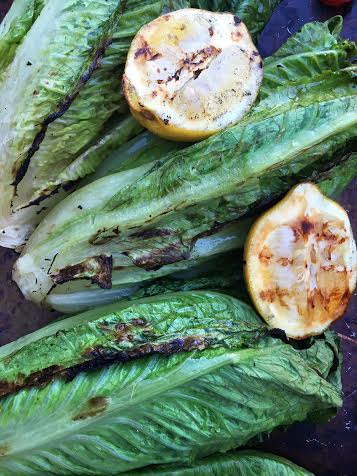 Grill the romaine hearts and lemons over medium high heat flipping as needed. The romaine is done when it has a nice char on the edges. To serve place a romaine heart on a plate, slice in half length wise. Top with croutons, dressing, freshly grated parmigiana reggina and finish with squeezing the juice of half a grilled lemon over everything. Your Grilled Caesar salad looks and sounds amazing, Redawna! We have made grilled romaine few times as a side dish and we love it. I can see how wonderful it is in a Caesar salad!